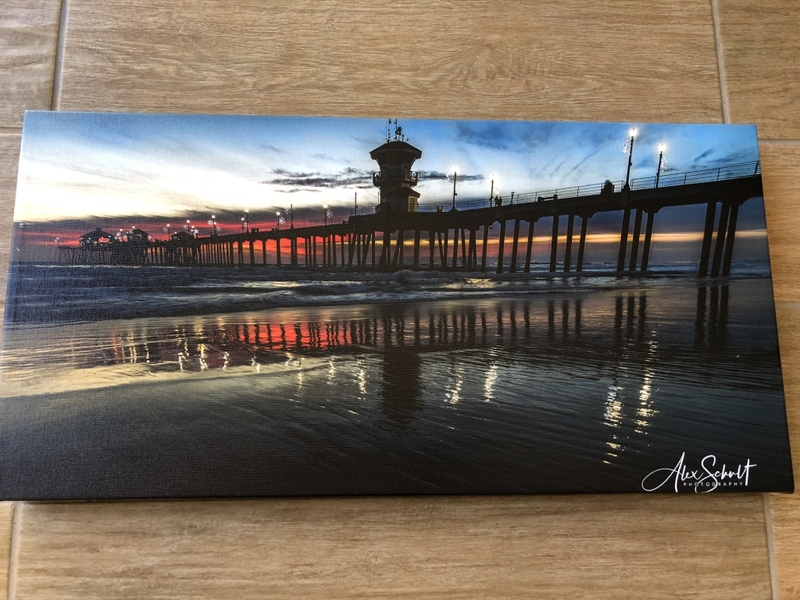 Who doesn’t like a good canvas print? The challenge is, how do you know you are getting the most for your dollar? You go to Google and there seems to be hundreds of companies offering canvases, and every canvas company claims to be the best. So why not select three mainstream companies and have a good old-fashioned shootout?! (Queue the banjo)… Yee Haw! So, I decided to set a budget for $100. With that budget, I would set out to get the best print with most options with each of these three companies and try to do so without going over budget. The three companies that were selected for this secret shopper print off are canvas companies popular with photographers. I knew this was going to be fun! Now, before you scroll down further, please watch the short video below. I want to get you involved in the action. In the video, you’ll see each canvas print with a Post-It with an “A,” “B,” or “C” on it. Without cheating and scanning down…I want you to make a mental decision which you think looks the best. Then we’ll dive into particulars in the video. Sound good? OK, now that you have watched the video…which did you like the most? 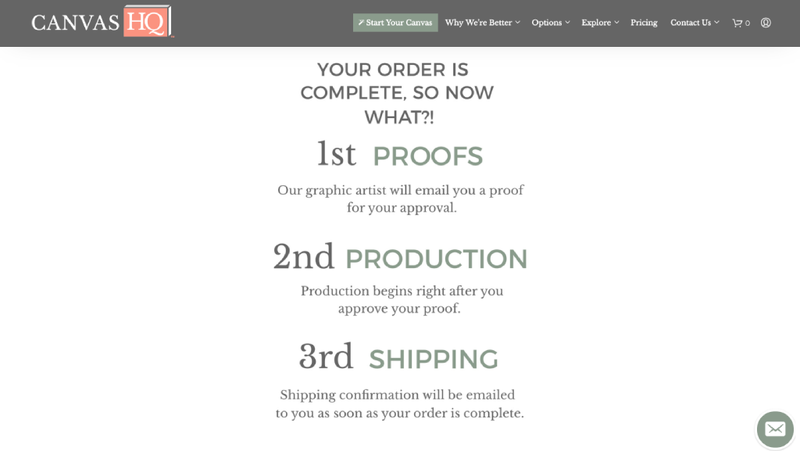 Let’s break down when I ordered these prints and the process of ordering. I’ve included screenshots and photos from the entire process. 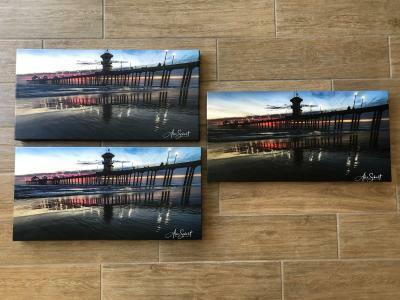 Each print was ordered around same time between 10 and 11pm. There was no reason for this, it just happened to be a time when I was free to do so. Honestly, I had high hopes for Pixel2Canvas. I know the owners and they are great people. 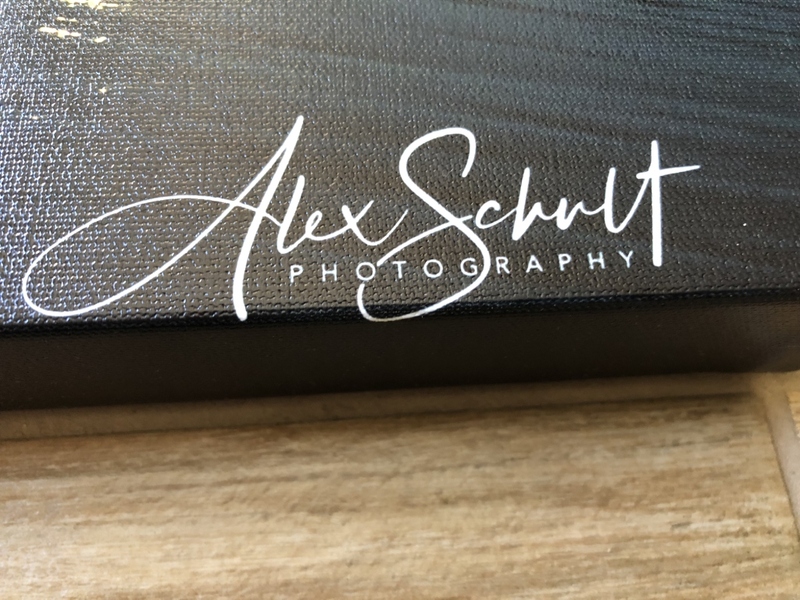 Matter of fact, they did some canvas prints for my wedding back in 2012 and I enjoyed some drinks with them at a WPPI party a number of years ago. 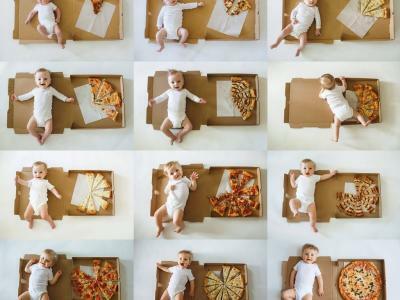 The ordering process was pretty straightforward for the most part. I found myself a little lost on the second page as I was trying to figure out what to do next. That's because the upload option was buried towards the bottom of the page underneath a few scrolls of print, frame, finishes, and hanger options. These were not clickable, just for information. Once I scrolled down, I was greeted with the option to upload an image. The next page gave me the option to select a size and shows a preview of what the print will look like. 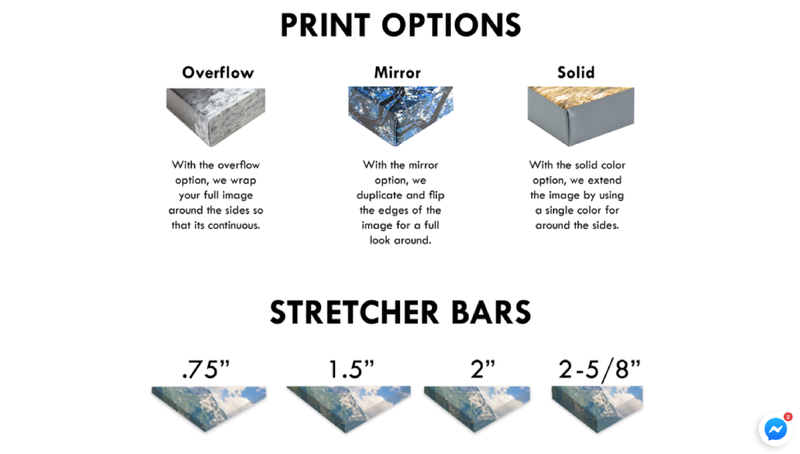 The following page opens up options for different types of finishes, styles, and all sort of upgrades, including the option to get a digital proof of this for an added $6. Sticking to the rules of this shootout, I’m already over budget for this print and just needed to figure out how to get out of there without incurring extra cost. I had a 15% coupon, which on $110 so far would get me down to $96. Without knowing what shipping was going to be, as much as I wanted the digital proof, which by itself would set me over budget, I would have to pass. Another thing I found a little frustrating is the location of the checkout - it’s not available at the “Add to Cart” section down below. Instead, you need to scroll above to top menu to find the downward arrow at that cart button. Finally, I see what shipping is going to cost to my home. It was $23. Yikes! Houston we have a budget problem. I’m glad I didn’t opt for any of the upgrades earlier because I’m way over budget and even with the 15% coupon… I’m toast. First off, I was surprised it cost $23 to ship from Las Vegas to the Los Angeles area. This shipping cost was the most out of all the companies, and yet this was the closest to me in terms of miles. 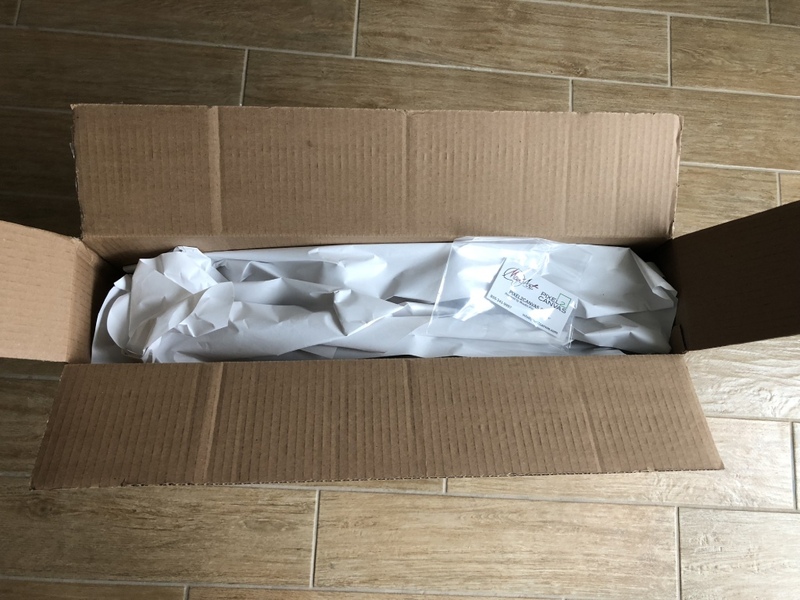 I also expected this thing to be packaged up a little more secure than it was. 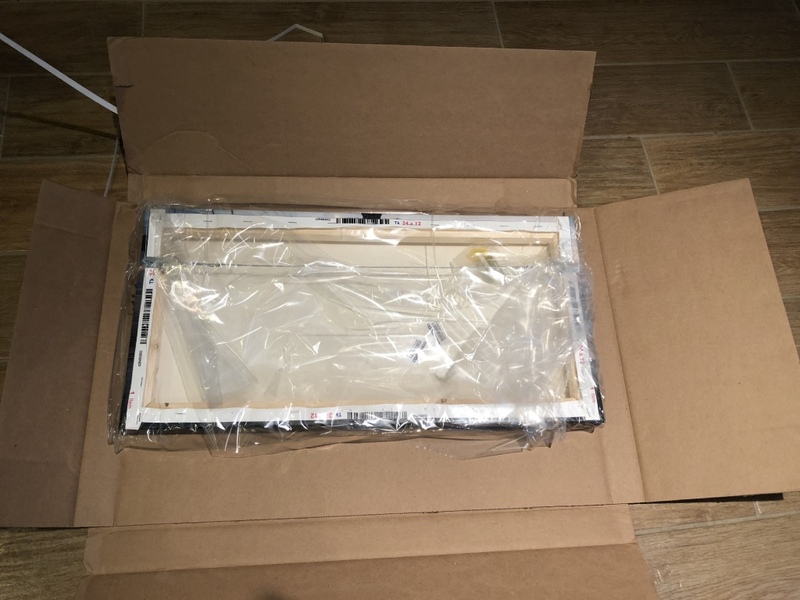 It was moving all around in the box, which can certainly mean damage in shipment. Well, I have to say, I was really expecting something else here. At this price point and with my past dealings with this company with my wedding prints, I was expecting something incredible. I won’t say what I got was bad, but it wasn’t knocking the doors off either. While the back is covered, which I do like even though it serves no purpose, I was surprised that I didn't find some corner bracing and no center bracing. Regarding the front side of the print, it didn’t seem like things were calibrated. For example, my signature was hanging over the front edge, it was way oversaturated, and the colors now looked unnatural and lost much of the detail. 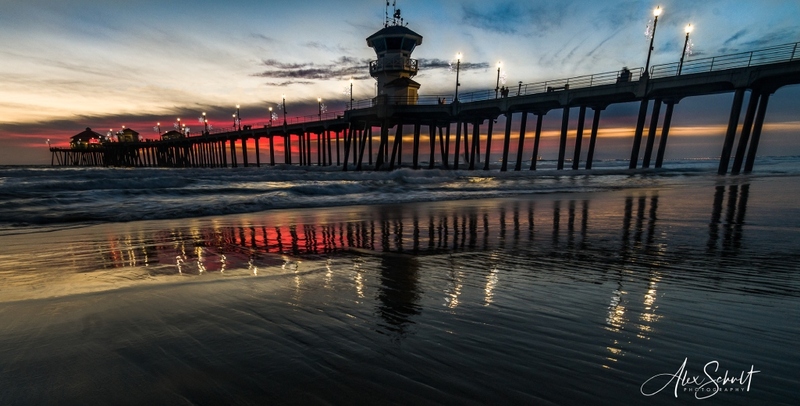 The shadows disappeared, and there was a notable reduction in details in the water ripples and the tower on the pier. Lastly, I felt the canvas was heavily textured. 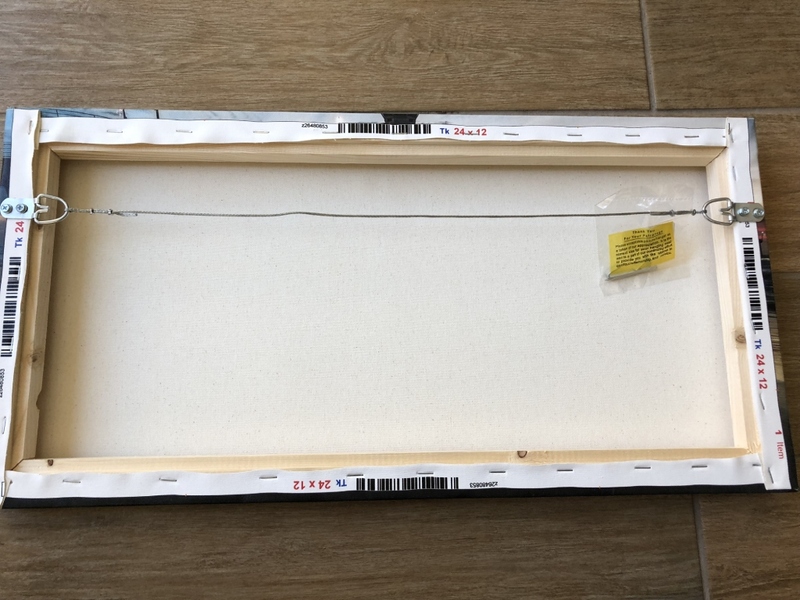 Where others provided hanging hardware, Pixel2Canvas including nothing. In addition to that, there was no proactive survey after the order to gauge customer satisfaction, as was done by others. Now, granted, during the check-out process, they show a badge for a 90-day guarantee. However, this doesn’t do anything towards reaching out to make sure the client is 100% happy. All told, this is a "looks good from 15 feet away" sort of print. OK, with these guys, I didn’t have much of any expectations. 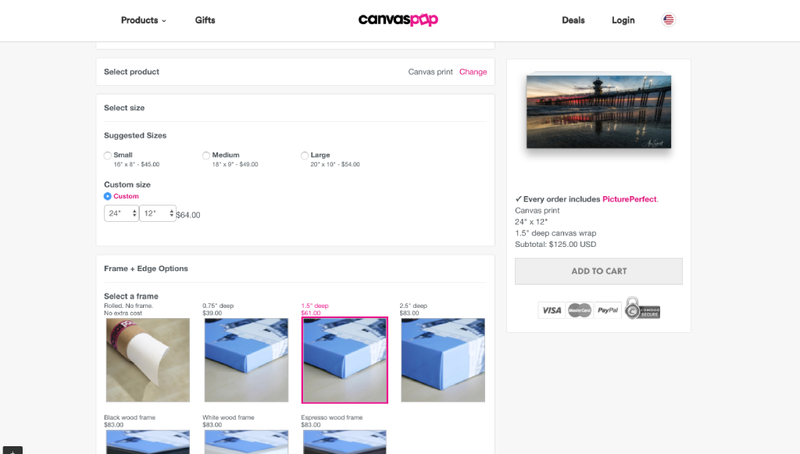 CanvasPop was selected because I keep seeing their ads popping up all over my Facebook page. 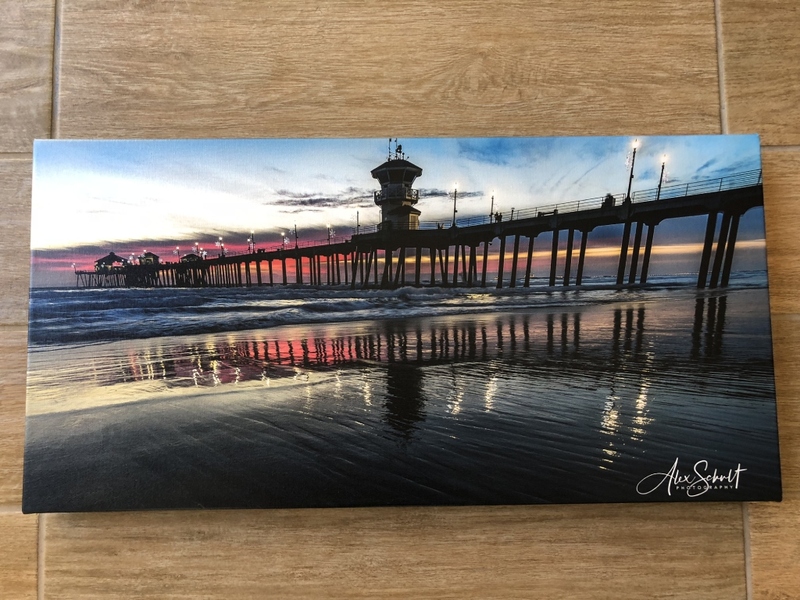 I had never ordered from this company personally, however, I had seen many questions sprouting up inquiring about the quality of these prints versus other options. The ordering process for me with this print was pretty much what you would expect. As you can see from this screenshot, this page occupies my entire screen (I’m on a Macbook Pro 15”). As soon as I clicked on the frame selection, my attention was brought over to the again vibrant pink “Add to Cart” button that is now lit up on the right. This tells me I have performed the actions needed on this page and the next step is the shopping cart. Now, full disclosure guys…the day that I placed this order, that is what I did - I clicked on the Add to Cart button. As I’m writing this, I’m going through each site with a ‘dummy order’ just to sync up my original notes. As consumers, we are programmed that when a button turns from gray to a bright color, we have performed the actions required and it’s time for the next step. This page is flawed, and it's my opinion that “Add to Cart” shouldn’t illuminate UNTIL the consumer has gone through the final options, ESPECIALLY regarding the digital proof. Putting digital proofs as an option or even charging for them (as with Pixel2Canvas), shouldn’t be left for chance or purchase. Put the burden of satisfaction in the clients' hands each time, send out a digital proof, and make sure the client is happy. That way, there is less chance for error. That’s my 2 1/2 cents of opinion! Anyway, as it turns out, if you select the frame and disregard the tempting “Add to Cart” button, you now have choices below that give you the option to getting a digital proof. Moving forward from here, I was shown my order preview with a ‘Continue to Checkout’ button. I this point, I could select shipping and enter a coupon code. Now, keep in mind we have a 50% coupon that will take our total from $125 down to $62.50 before tax added $5.55 (does this company have a location in California or something?). Shipping costs were either $14 for standard or $39 for Rush. Well, it’s a good thing this wasn’t needed quickly as that $39 shipping cost would throw this over budget without including the tax that was collected. From here, the party is pretty much over. I made one final confirmation and the order was placed. When I ordered all these prints, as you can see from the above chart I made, I tracked the distance to me from each print shop. 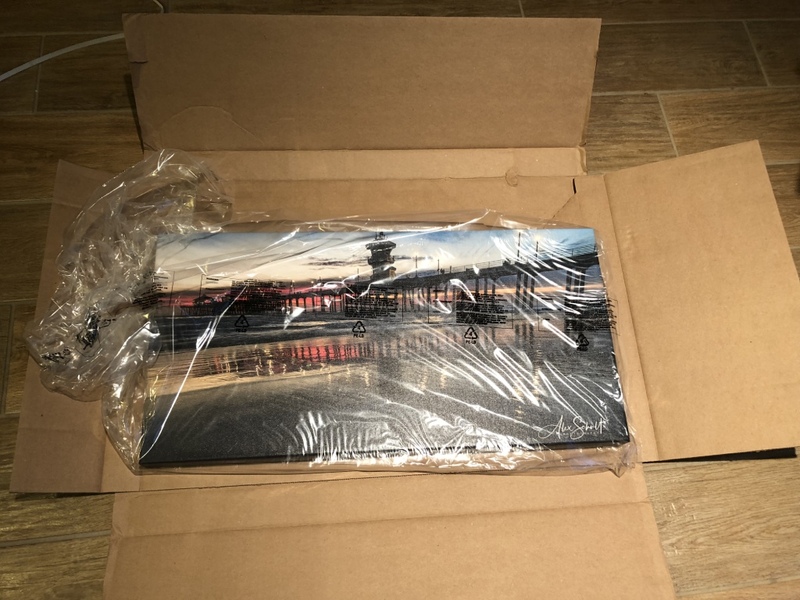 With CanvasPop, it showed them as being from Las Vegas, then a shipping confirmation came in showing North Carolina, then when the print arrived…it’s from Colorado. Seriously - I’m not sure who this canvas came from at this point! 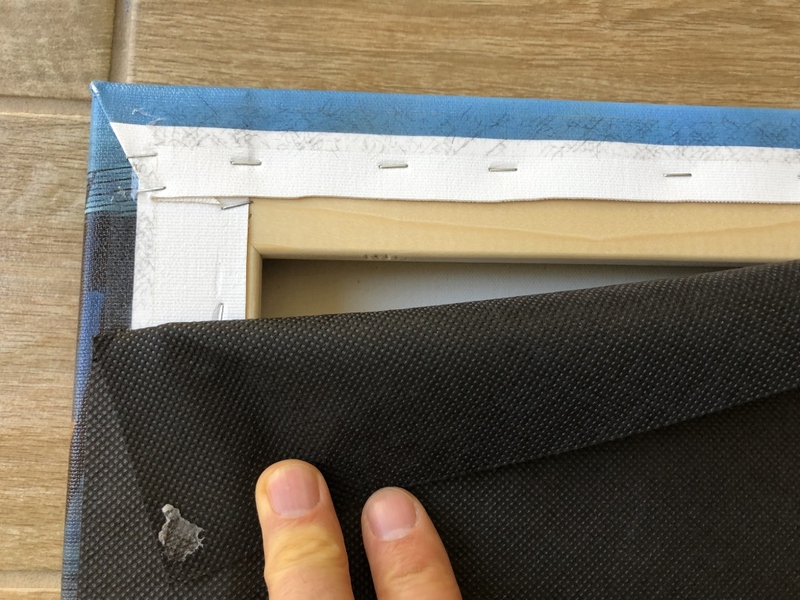 Getting back on point, there was no protection for my canvas print with CanvasPop with the exception of a plastic bag. 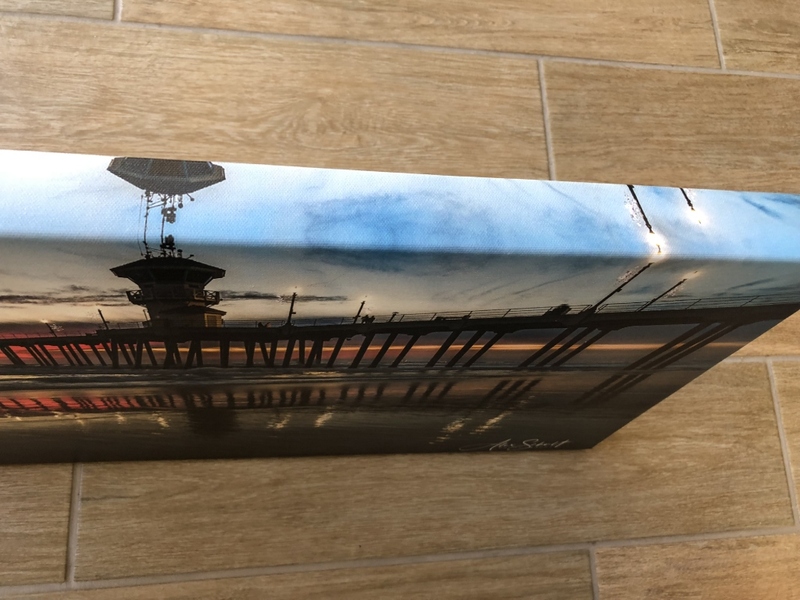 The canvas was shaking around inside this box. Frankly, I’m glad this was a test print and not an important photo that had meaning to me. I’m not sure where to start with this one. As I start typing this out, I found myself struggling to come up with a positive remark before I dive into items that I found not flattering. The fact is, after the Pixel2Canvas print came in, with the over saturated colors, shadows lost, and my logo hanging over the front, I thought for sure Pixel2Canvas would have been doomed and secured the 3rd spot for sure. Forget that both companies botched shipping safety, and let’s focus on the canvas. When I took the unprotected CanvasPop print out of the box, I really felt like my fingers were going to go through the print. It wasn’t tight and it felt like a textured balloon. It just felt cheap. 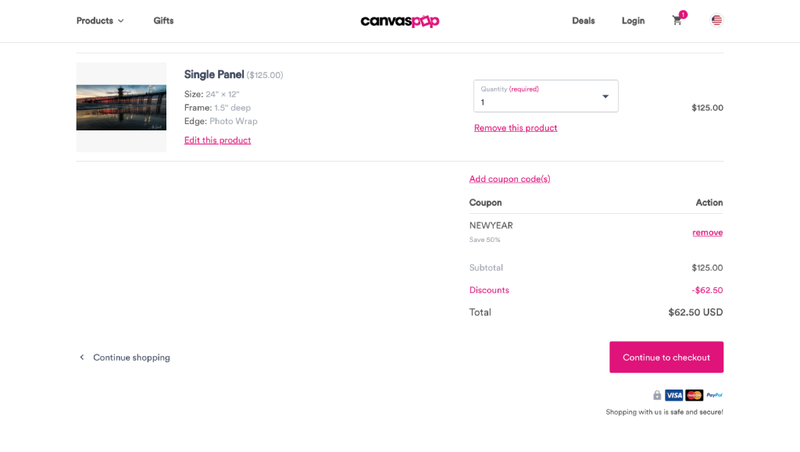 Not to be all gloom, CanvasPop did include some complimentary hanging hardware, which wasn’t included with Pixel2Canvas. One item that drove me up the wall and back was the mirrored top edge. When I saw this, I can’t believe that someone quality controlled this, and allowed this to ship! In addition, the colors were very warm in their print. I found ink rubbed on the corners and an ink smudge on the center bottom of the canvas. Speaking of the corners, these were so sloppy with the flap showing from the back, poking out for the viewer to see from the front of the print! The stretcher bar could be seen from the front as well with the thin canvas resting up against the stretcher bar. 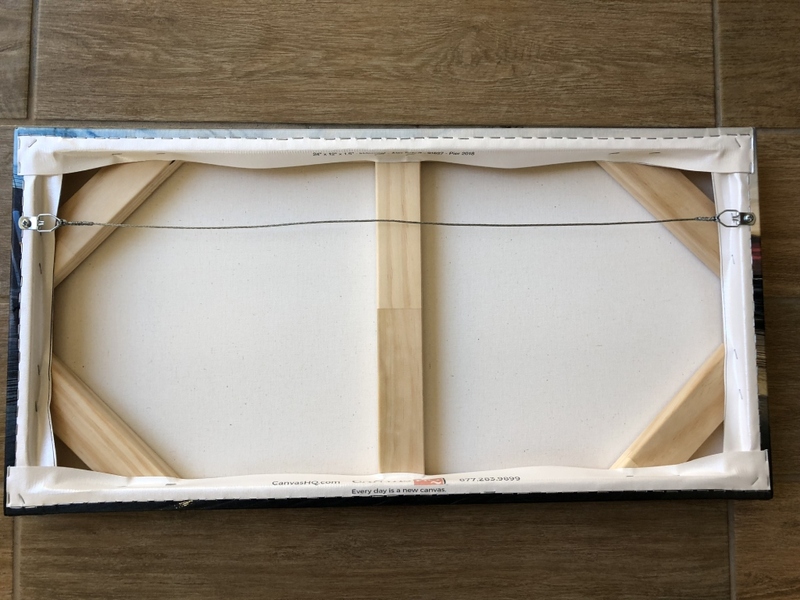 Again, like Pixel2Canvas, there was no corner bracing or center bracing. 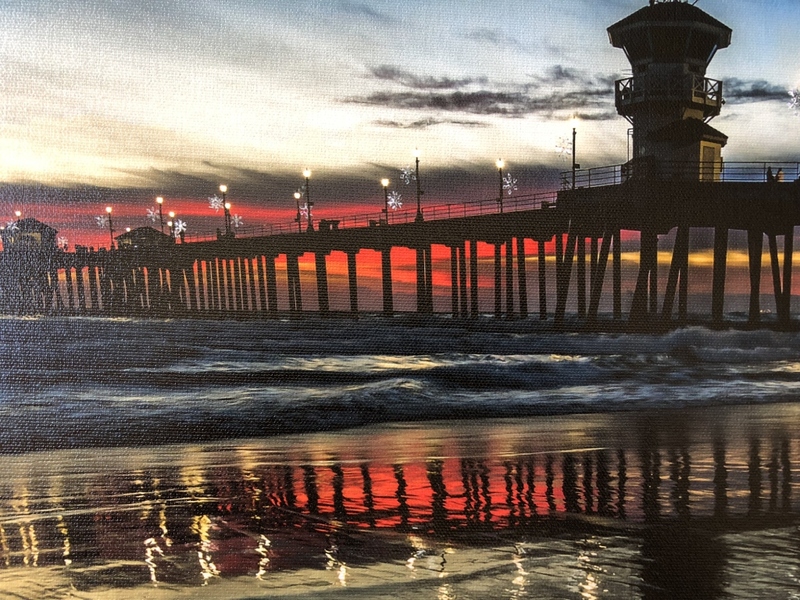 The canvas was overstretched with the mirrored border with the lighthouse and light poles replicated along the border. The back side had few staples holding this all together, and where they pulled it too tight, the canvas was torn (the thin canvas didn't help with that). Had better canvas been used here, they would likely have been able to get away with tighter tolerances. What was a surprise to see were bubbles in the border from what I’m guessing was related to the canvas not being stretched correctly or the lack of bracing causing the frame to give. To be honest, CanvasHQ has been my go-to source for canvas prints for a number of years (since my son was born) for some very good reasons. These guys don’t miss a beat. 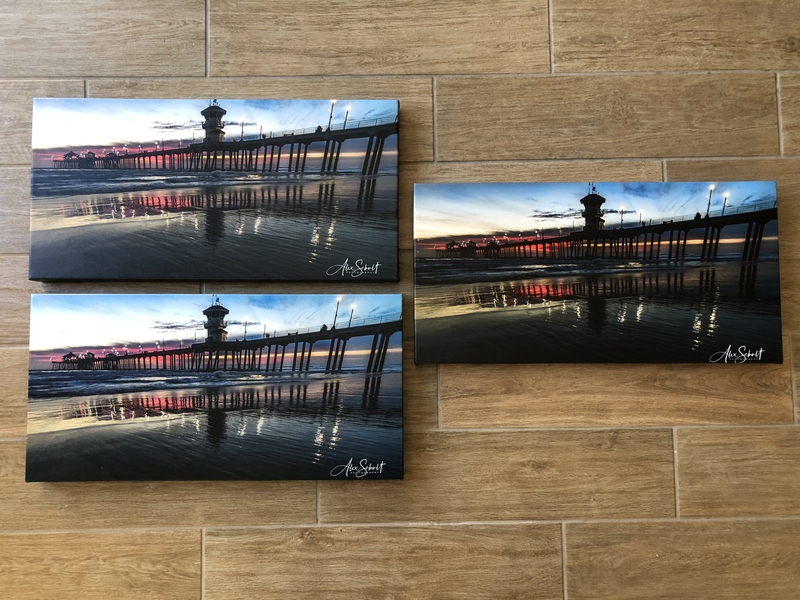 Over the years I have unofficially tested a number of canvas companies, however never something like this test with the same print, print size, and budget. So keeping that in mind, yeah, I had very high expectations. This sort of test would prove if my opinion for this company was justified or if I had been picking up my canvas with the wrong shop. Over the years, CanvasHQ has managed to continue to streamline the ordering process to a rather simplistic experience. You start off with clicking on a “Start your Canvas” button from the top, where I was presented with a big button to drag my photo or click to fetch from my computer. As I write this, I just realized something. The flow that CanvasHQ follows kind of reminds me of the ordering process with Apple. They remove distractions and make things crazy simple. 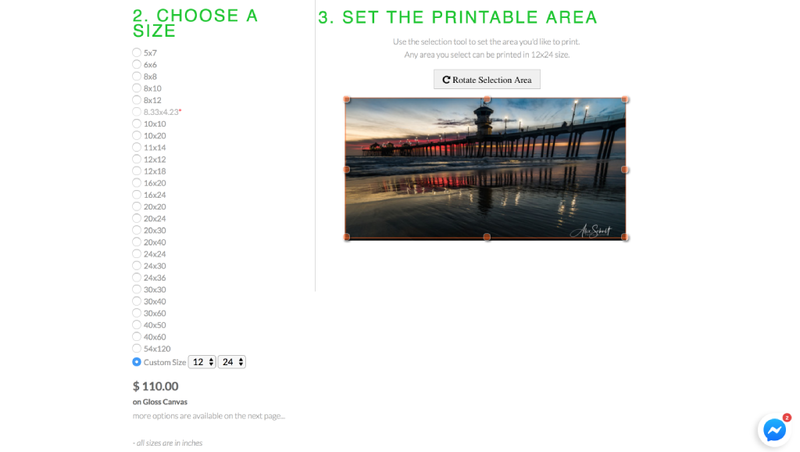 For example, the next page I encountered gave me options to select size, border, frame depth, image effect, and more. Seeing that I had no idea what a few of these would do to my photo, and that these are upcharges, I would have liked to see a “?” or something that I could click on to get a brief description of these options. In my opinion, this would remove buyer anxiety, and I believe could result in higher sales for CanvasHQ. As for me, I decided to pass on these options. One thing that jumped out at me and something that I wish others would follow is communicating shipping costs up front. If you look at the last screenshot, in huge font below my canvas print preview, it reads, “Order Now for Free Shipping." Oh heck yes! 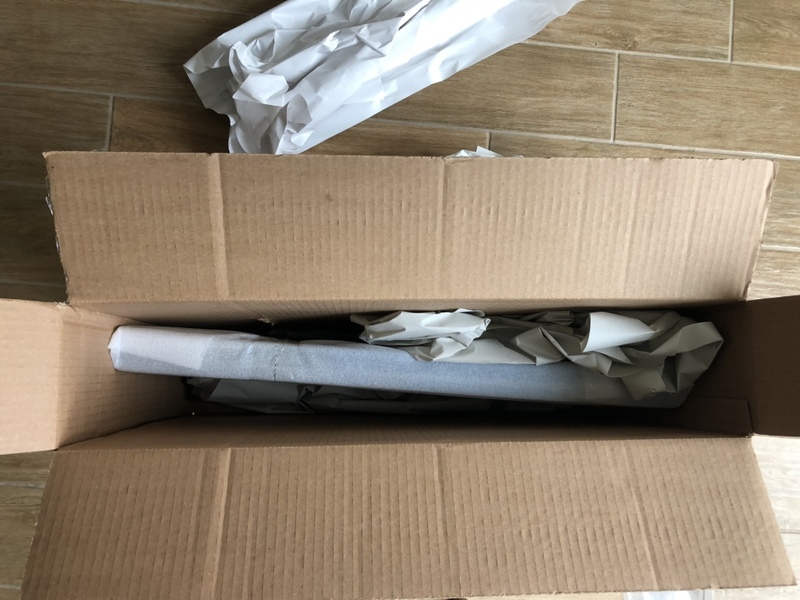 As a consumer or professional that is on a budget, knowing the cost of shipping upfront reduces anxiety, and I would bet having that there impacts higher percentages of upgrades. People know upfront they have more bucks to spend on their print and not shipping! CHA-CHING! CanvasHQ isn’t leaving anything for chance and defaults to having “Free Email Proof” and “Free Image Touchup (if needed)” defaulted to YES! I feel like someone needs to hit the golden buzzer for this!! Smart move guys…don’t leave anything for chance, the burden of satisfaction is on me now. Bravo. Once I selected all the bells and whistles that I wanted, I selected “Add to Cart” from the top right, which brought me to my ‘Cart.’ At that point, I could either continue shopping or click on through to ‘Proceed to Checkout’ by clicking on one of two green buttons on the right. 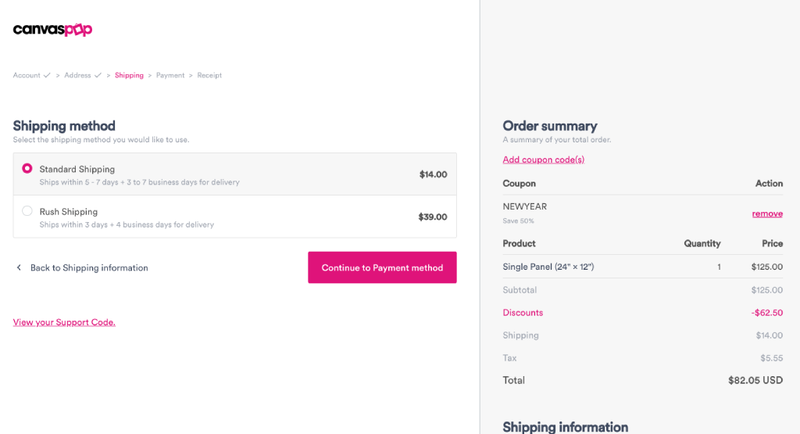 I now found myself on the checkout page, which is a fantastically designed page, with the exception of one item I would love to see moved higher up. You see, I have an awesome, shiny 25% coupon code to use here, and the promo code field is all the way down at the bottom. I would prefer to see that right with the rest of the numbers relating to my order, as opposed me having to scroll down and look for it. I entered the coupon code, numerous bucks were saved, and off we go! 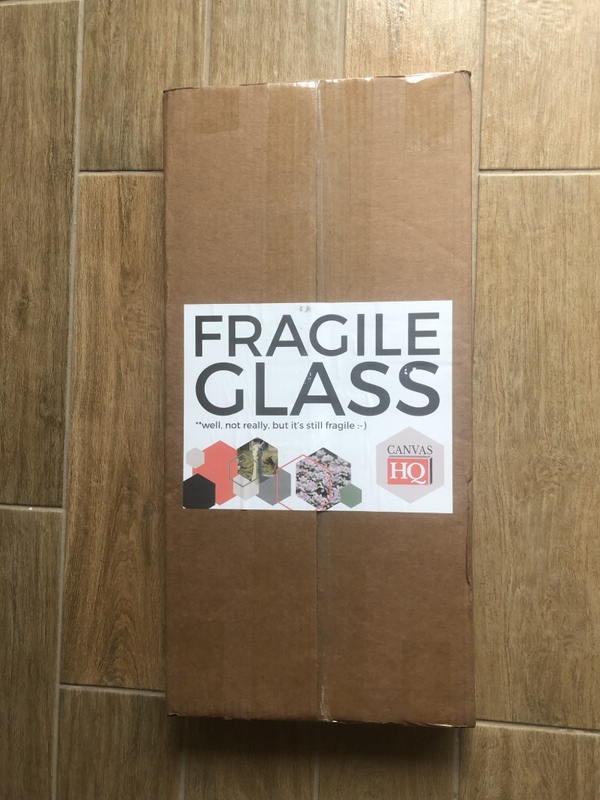 What makes this shipment stand out to me is that out of the three companies tested here, CanvasHQ is the only one with a huge “Fragile Glass” decal on the box that takes up about 1/3 of the box size. At least this will keep the UPS or FedEx guy from drop-kicking this thing from Arkansas to California! LOL. 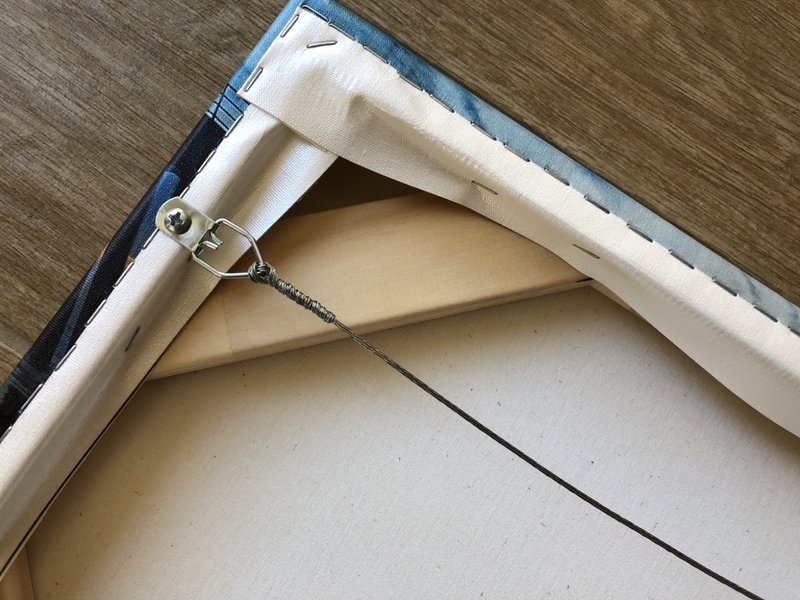 The canvas was wrapped in a few layers of cardboard AND taped in place to prevent it from shuffling around. 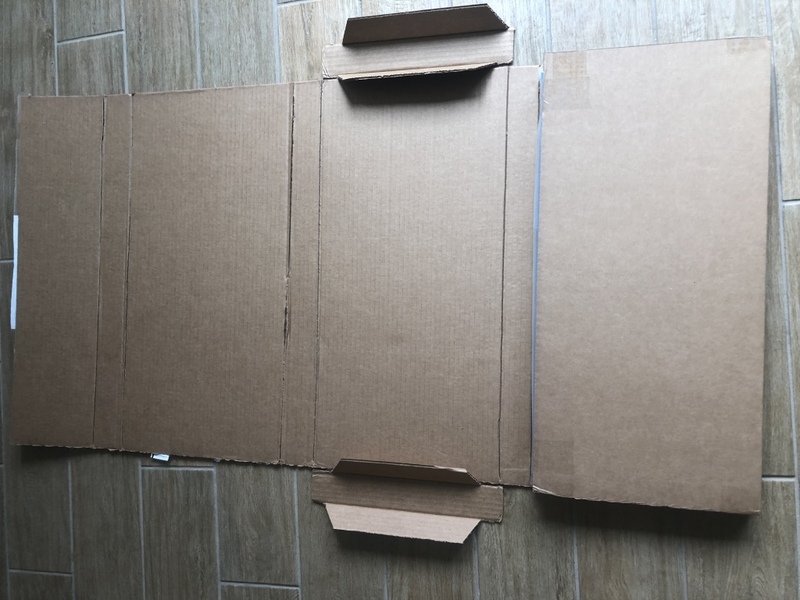 I can’t imagine this is the most inexpensive way to package a print. Actually, I doubt saving money is the main concern here. I’d say the safety of the print was. OK, this print seriously rocked. My colors were on the dot, the quality of the canvas really showed, not to mention the canvas was TIGHT. Actually, I’d be curious how in the world they pull this off? Regardless, it felt and looked fantastic. Now one thing that I always enjoy on a canvas is the back cover, and CanvasHQ doesn’t have one. I know, I know… it doesn’t do anything. However, looking at this from a test standpoint, it does serve as a big AHA, and this having none, brings awareness to framing standards between companies. 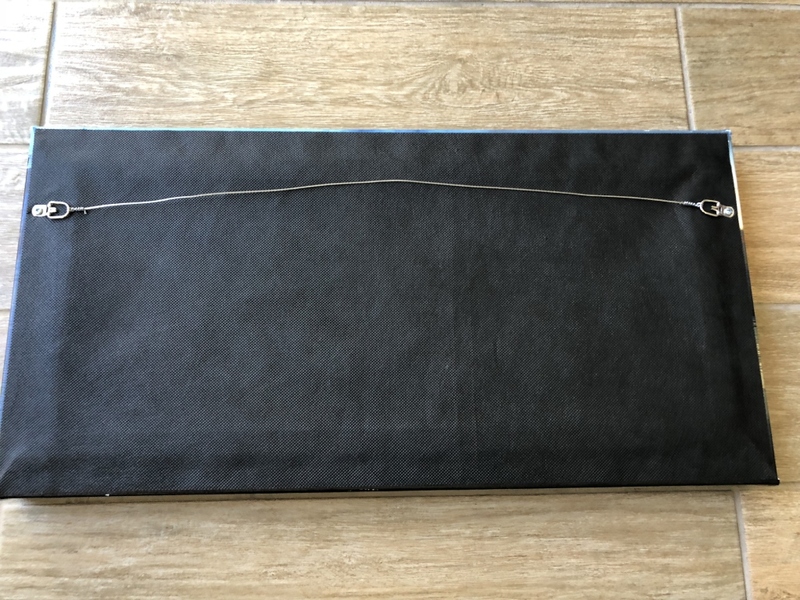 If you spend the bucks on your print, the last thing you want is for it to bend or buckle over time. The CanvasHQ frame is something pretty slick, and they aren’t shy to show it off. There is not only corner bracing, but there is also a center brace as well. Speaking of the backside of this thing, these guys shipped all sorts of swag attached to the back side of this print. 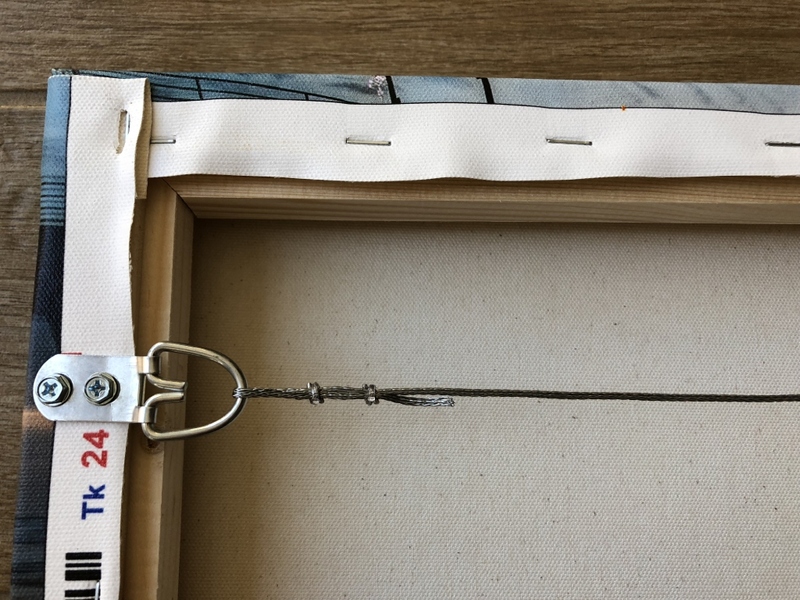 There was hanging hardware with illustrations on how to hang the canvas. And two items that bridge this companies dedication to your satisfaction and gratitude: A thank you card and “How did we do?” card. I don’t understand why others don’t do this! While beautiful in design, these cards can’t be that expensive when ordered in bulk. 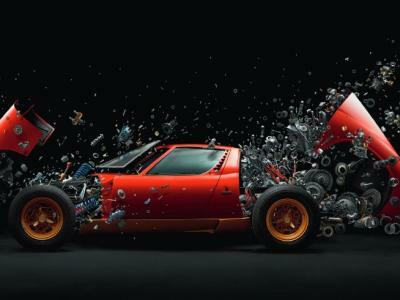 The feeling I get as a consumer when I see something like that is unmeasurable. Let’s get back to talking about the print itself. Again, the colors are spot on, my shadows are not too dark, and detail is maintained throughout this print. The reflection of the water still looks wet, even on canvas! These guys took the time to position my signature so it wasn’t hanging over the edge, too. Like the others, this print looks good from 15 feet away, but where this one shines and the others didn’t, is it looks great one foot away! CanvasHQ plays the inside close came like Super bowl champs! As a professional photographer that sometimes spends hours or even days studying to get the shot right and then post-processing to get light and colors perfect, it’s really important to have reproductions of work done with a company that is equally as picky as I am. Aside from colors being accurate, when I have my work blind shipped to my customers, you have to trust that the printer will do a good job. 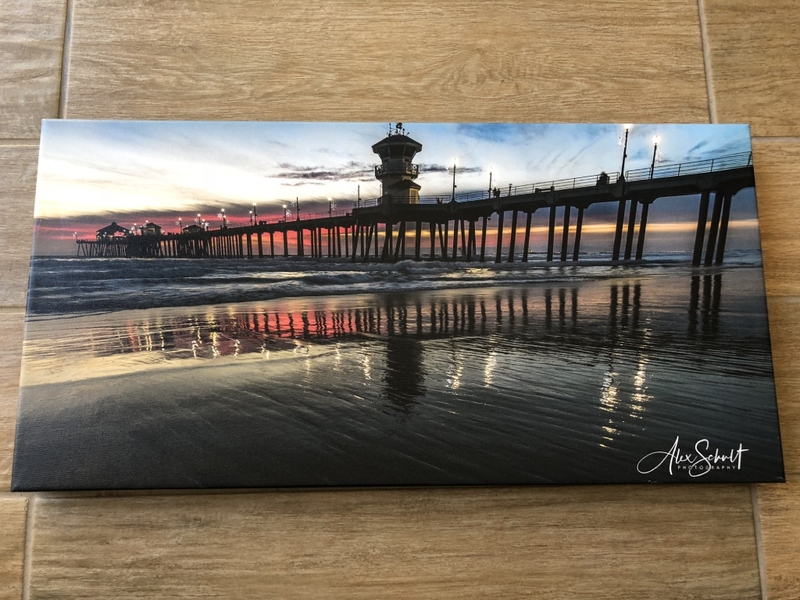 I don’t know about you, but I only want to hear from my customers when they are so proud of their purchase and not calling to tell me about the unprofessional canvas print they just received. 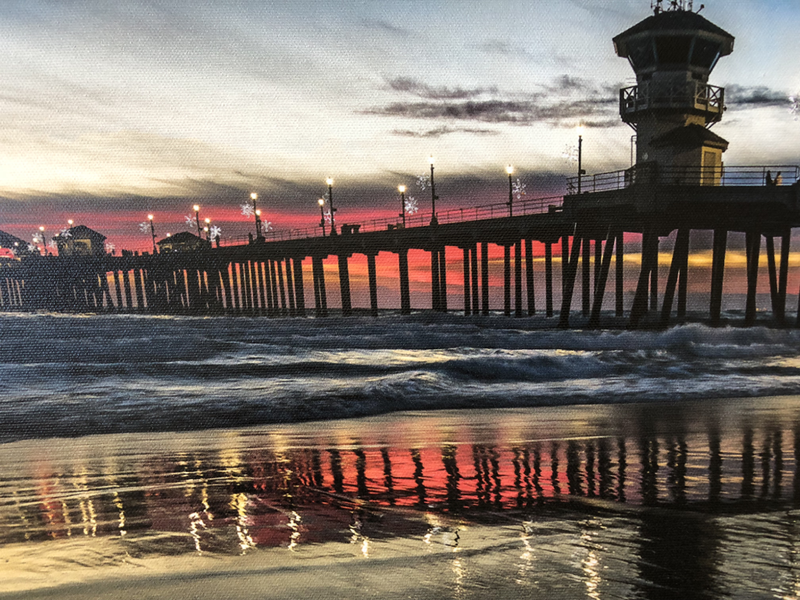 When I set out to do this Best Canvas Print Company 2019: $100 Secret Shopper Print Shootout, I honestly thought it would be a neck and neck race. What I have learned is how important attention to details are. 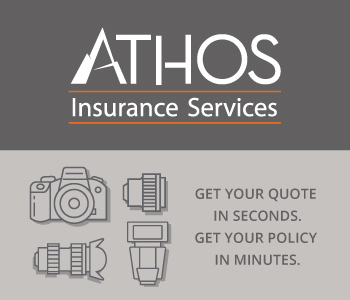 I have found that as a photographer, often times we are all very small businesses ourselves and partnering with a small family business results in a company that is as invested in your customers' happiness as you are. 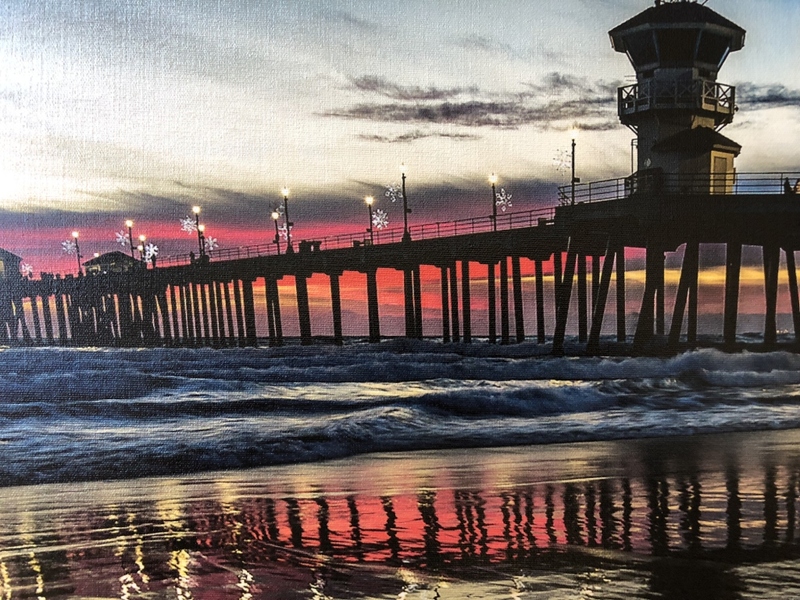 You’re looking for high-quality canvas prints, attention to detail from graphics to the proof, accurate colors, true craftsmanship in the frame with extensive bracing, and all packaged up with the utmost care to ensure the canvas is delivered unscathed with hanging hardware to boot. If you can tick all those boxes, you really end up with what obviously looks like a work of art from the canvas print experts. 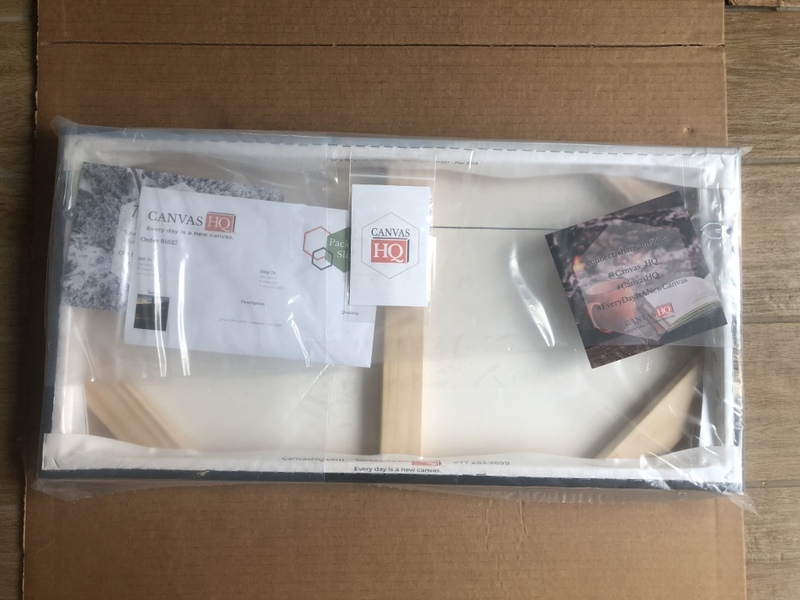 Attention to detail and clear communication is what I got from the moment I clicked “start your canvas” until the survey feedback email that followed two days after receiving my canvas print. 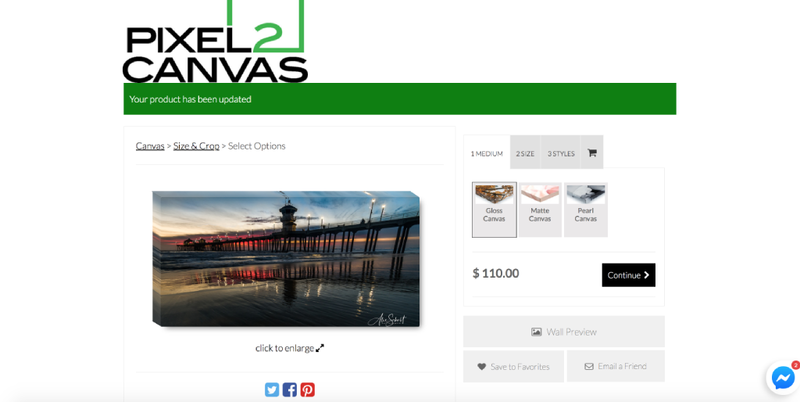 So at the end folks, when you compare the quality of the print, shipping, and cost, you can remove my opinion and make a sound decision, one that for most will be obvious, and that winner is CanvasHQ. 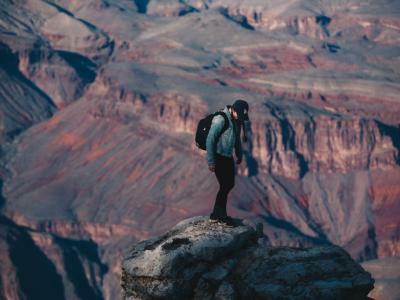 Congrats, CanvasHQ, on a job VERY well done!